Theo Mason/Staff Photographer “The Path of Tolerance” features over 90 posters from artists around the world. The public art exhibition will be on view on the Spine through Oct. 9. Walking to class this week, students will temporarily be marching alongside a very important message. On Sept. 23, Binghamton University welcomed “The Path of Tolerance,” an on-campus art exhibition being displayed down the Spine. It includes over 90 pieces from artists around the world, focusing on the central theme of peace. Every poster is unique, but shares one set of specifications: Every work contains the artist’s signature, country and the word “tolerance.” The concept of this exhibition is to make the art tangible by putting them down as stickers, allowing the viewer to take them in at their leisure. Ellen Cui, a junior majoring in art and design, is supportive of its interactive experience on campus. The posters are presented in both black and white and full color and vary by style, font and illustration. Some are simple and straightforward; others prompt the viewer to read into symbolic meaning. The hourlong opening reception featured a guided tour from Mirko Ilić, the curator of the project, who walked the audience through the displays while providing background about some of the pieces. The accumulation of artwork started about a year and a half ago, when Ilić was asked to participate in the Festival of Tolerance in Slovenia. Instead of filling the space with his own visuals, Ilić requested artists from around the world to contribute to the collection. The original show included 24 works of art from 24 different artists; the success of the initial show prompted its continuation. Last week, “The Path of Tolerance” opened in Russia; in the following weeks, it will open in Romania and Finland as well. To host the exhibition on campus, it was less about Ilić choosing BU as much as it was about the University choosing him. 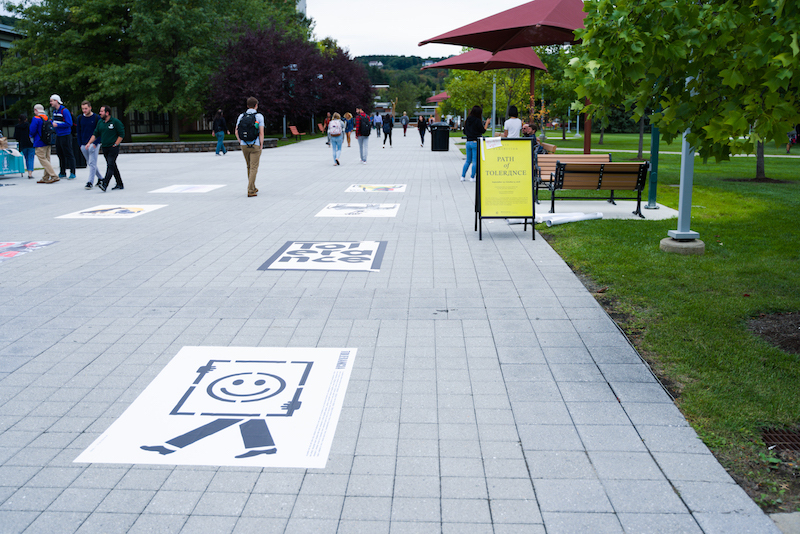 Bringing the show to campus was put in the works by Blazo Kovacevic, an assistant professor of art and design. The exhibition includes the first piece Ilić requested, by artist Milton Glaser. Glaser is known for his work as a graphic designer and for creating the famous “I Heart NY” logo. Another work is from Edel Rodriguez, who is popularly known for his covers of Time magazine. Though the show emphasizes tolerance, at some locations it faces controversy due to the variety of artists and ideas presented. Depending on the location, hosts could be less receptive. Ilić emphasized the importance of the labels he required from the artists. When an audience member asked about a poster that seemed to express a biased opinion about the President Donald Trump, Ilić maintained his perspective about tolerance. He did not agree with the accusation about propagating personal opinions through the artwork selected. “That is [the artist’s] opinion,” he said. “I tolerate whatever they do because I believe in many opinions.” He later explained that the poster was not necessarily about Trump, as it included a message about the #MeToo movement. Veronica Liszewski, a junior majoring in art history, said that she enjoyed hearing from the curator himself the most. She noted that having blurbs by the posters explaining more about each piece would have been ideal for students who did not attend the speech. Ilić explained that gathering artwork from different places provides depth and encourages diversity. Ilić explained that the exhibition is continuously expanding and that new plans are in progress. The pieces on display are invited to participate in the Venice Biennale, and after that, plans are being made for many of the posters to be included in a book. Ilić will then continue amassing a new collection of posters. Ilić said that BU is probably his favorite location for the exhibition yet. The exhibition will be on display on the Spine through Oct. 9.